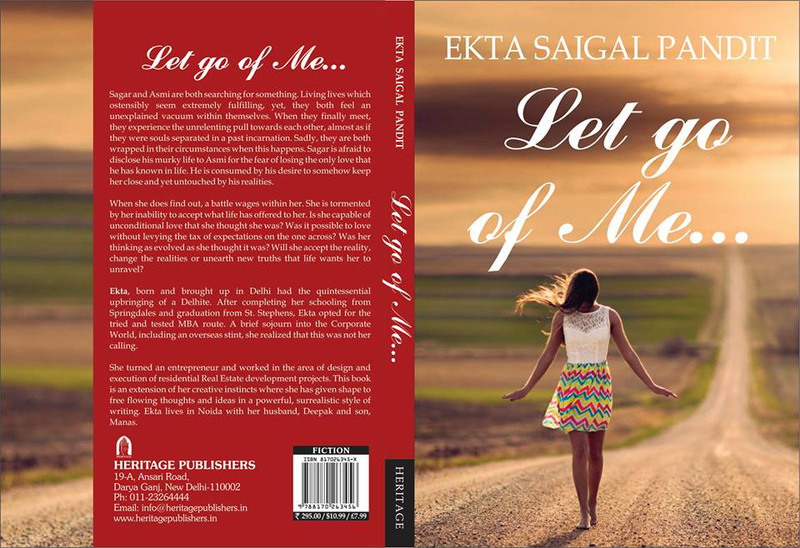 Today, I’m talking about a book, Let go of Me, written by Ekta Saigal Pandit. It’s fusion of fiction and non-fiction. As per my view, the cover of the book is somewhat confusing. The barefoot girl, in the cover, wearing colourful skirt indicates that the book is a chic lit, but the background of cover picture indicates that the book is philosophical. The book is highly philosophical. Let go of Me isn’t about an escape from some relationship but it’s about an escape from ‘Me’ – ‘I’ – ‘the ego.’ The cover of the book tells that the cover girl is joyous after travelling a long journey because she let go her ‘Me.’ She could now dance on streets like Meera Bai. As the cover may indicate that it’s a story of a girl in her teenage or 20s, but it isn’t. In fact, the lead protagonist, the heroine of the novel, is a 38 years old woman, who has been married for 14 years and mother of two children. On the other hand, the hero is also a married man of 32 and father of one child. The book is about the factors that lead these two protagonists to come together and share their deepest feelings. It isn’t the physical or sexual urge but a sense of true love. There’s nothing much on physical level of plot, i.e., the storyline. The only twist is that the hero is a male prostitute apart from working as a receptionist at hotel. The heroine is HR head of the same hotel. Most of the story goes inside the mind of the protagonists – how they think – why they think what they think. The plot mainly runs on psychological as well as spiritual level. The book is about reaching the supreme state of awareness through love. The book tells how to let your love expand and not let it become transactional. Asmi –> Asmi is a typical wife of modern society. She has to take care of her office as well as her household activities together. Also, she has to give explanation to everyone, especially at home front, for her actions or lack of them. She’s answerable to everyone at home, her husband, children & in-laws. Pleasing everyone at home, at work and all around her, she’s left with no equipment or energy to please her own self or to live a life which would add some life to her life. It gnaws on her that her closed environment doesn’t allow her freedom of life and expression that her persona demands. She wants to experience a life without restriction but couldn’t really share her feelings with anyone because no one is interested in listening her. She isn’t looking for judgement or analysis but for being understood without words, for someone who could pull her out of herself. Sagar –> Sagar is a man who sacrifices his entire life for the welfare of his family. For him, the happiness of the family comes before his personal happiness. He’s conditioned to meet the end result irrespective of the means. He’s a man who appears powerful on outside but could be moulded to any extent to suit the requirements of his family. Though he’s married and has a child, he doesn’t have any idea what falling in love means or what being loved by someone feels like unless he meets Asmi. Anita Fernandes –> Anita Fernandes is a 42 years old widow and sole owner of multi-million dollar business empire. She believes that money can buy everything and has the power to justify anything, any action or emotion. She has a sharp acumen, both of business and people. Besides being politically connected, shrewd and cunning, she keeps a vulture like gaze on all her possessions, which include the people she has dug her sight into. She becomes jealous and annoyed by the idea that her precious possessions are being shared. For her, it’s unjustified that someone else is getting for free what she has bought by spending lots of money. She takes every possible step to make the person pay for it. The book isn’t a commercial movie but an art film. It deals a serious subject in a serious manner. Obviously, it’s a slow read because it has many things that’ll compel you to ponder. It isn’t tequila shot but an old wine which needs to be sipped & savoured, and not to be finished in one gulp. For me, the writing style is a fusion of fiction & non-fiction. The book isn’t about the story but the message. Each chapter starts with a haiku, which sets the mood of the chapter. The haiku give the hint of the emotions which are going to be dealt in the chapters. Each chapter deals a particular state of mind. Am I here or there? At every crucial stage of life, there are two paths and one of them leads you to higher planes of awareness. The question is: How you gonna know, which path will lead you to higher planes? Here comes the utility of this book. This book could help you in knowing the correct path. The author successfully managed to create such crucial stages in the lives of the protagonists of the book. The two protagonists choose different paths. From the logic behind their decisions and their consequences after choosing the specific path will help you in deciding your correct path in such situations. Normally, what I do in my annotations is, I talk about the theme of the book in spiritual context by citing some quotes from the book and explain them spiritually. But the author didn’t give me this opportunity in Let go of Me, she herself explained it in the book in great detail. So, I’m just giving a brief outline of philosophies dealt in the book. There are no such things as right & wrong, ideal or absolute. Everything is relative. Truth is subjective not objective. Everyone is given equal opportunities to make choices. Whatever we face in our lives is the consequences of the choices made by us. Each day is a fresh beginning to make a choice as to how we want to live it. The purpose of twin-lames or soul-mates is to reduce the karmic load that they are carrying, by sharing the lessons learnt by them individually while they are away from each other, and move forward to the source. In fact, the author propounded a theory in this regard by assimilating the Hindu concepts of Karma, Kundalini, Maya, Kosha, Aura and Layers of body along with Abrahimic concept of Satan, Freud’s views on Repression and the concept of Twin-flames in the context of love. I’d like to talk about three instances from the book that will reveal you author’s grip on the subject of spirituality. In an address to readers, the author said that even when each of our desire becomes reality, we are still dissatisfied. This realization is the beginning of spiritual quest. In the acknowledgement section, she said that thoughts are universally rooted. They are not created but perceived by us. What we think and the subject we think depends upon our plane of existence in the cosmos. When we are at a level in the cosmos, we simply attune ourselves to the threads of thoughts that float therein and become channels to bring them into physical manifestation. This revelation is the first step towards the journey of egolessness. The phrase ‘actions soaked in intention’ confirms the deep understanding of author on the subject of Karma. Actions are neutral; it’s the intent behind the actions that make them good or bad. She further reveals that one can escape from the cycle of karma by being an observer or through actions free of intent. This is indeed the essence of Karma Yoga. In relationship, the irony is everyone wants to be understood but no one wants to understand others. The ironies in life and relationship are wonderfully illustrated by the author in the book. The book is full of words of wisdom, especially in the context of spirituality and paradox of life. I felt it’d be unfair to quote some and leave the others, so I decided not to select any from these sections but to focus on other areas of the book. A book doesn’t happen in a day or a year. It builds within oneself over the years and takes a concrete shape when it must. There is something, not in the way these people look but the way they look at you, that catches your attention. They have something extra in their eyes, eyes that connect directly to the soul. One needs to have either grown up to survive in the uncertain, formidable wilderness and inculcated these traits instinctively or needs to unlearn the so-called virtues of societal existence and adapt. If you cannot speak the truth to the person who you claim to love more than you love yourself, you cannot even speak the truth to yourself. We value people not for who they are but for what they mean to us and the reverence we feel on seeing them. A journey that is undertaken alone sometimes becomes more beautiful and invigorating because of a set of footsteps next to ours. Brushing off the dust and cobwebs from over the lock, she pushed open the heavy teak door. It creaked as if to reveal its annoyance in being forgotten for so long. Treading into the desolate and dusty vestibule leading into the atrium brought about a surge of memories. The silence was intimidating and the smell of the space being unaired for eons entered her nostrils, making her feel guilty and slightly nauseous at the same time. Looks like an interesting book. Good review Ravish. Thanks for sharing. Excellent review done. Very elaborate. intersting review of the book. Ravish…my sincere gratitude for reading “Let Go of me” so thoroughly. Your review is indeed exhaustive and it is evident that you have been able to delve deep into the layers of my mind. It’s an honour to have someone review your work so thoroughly. Thank you for your patience and time. Ur right, the chic lit aura would have alienated me forever. However , as always, ur review makes a mini book in itself.Looking forward to your very own. Sita’s curse had a similar premise of a woman finding love in a male prostitute. Have you reviewed it? This one sounds quite intriguing! As usual a wonderful and in depth review Ravish. Thanks, Bushra, for your kindness & generosity. May the pious month bring peace & prosperity in your life! Very well captured Ravish. Interesting take. A break from regular commercial love stories. With your review, you sold the book to me. Exhaustive review as always. The book definitely seems like something I could pick up. A very exhaustive review and your views on relationship and cheating are worth pondering here. I find the cover a bit serene, a girl is there to make a journey, on her own… that’s what I thought at the first glance. This is certainly the book I should read. Thank you for putting up such an exhaustive review Ravish.